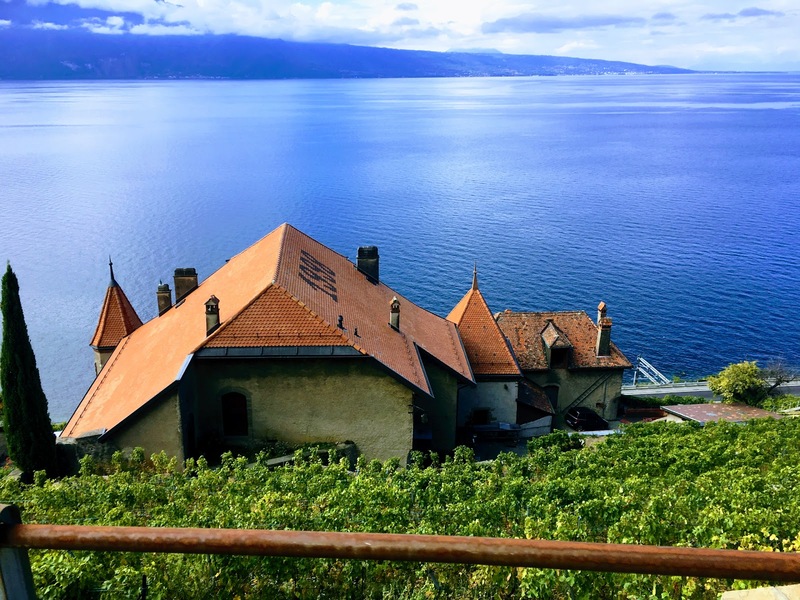 This 6.8 Mile (11 Km) hike traverses through the Lavaux vineyards on gravel and concrete pathways. It begins at the Lutry train station and winds through vineyards and small vineyard making towns until it ends at the Saint Saphorin train station. The walk is a lot of up and down throughout with the first mile being almost entirely uphill and the last mile mostly downhill. The middle section has short bouts of up and down with small straight areas mixed in as well. Fortunately this narrow area was not very far (maybe 15 feet). And if you had a smaller stroller (umbrella stroller) I think the wheels would have fit. The walk follows the lake and offers great views of Lake Geneva with the alps jutting up on the other side. Along the way, we passed old stone homes centered in the vineyard they owned, castles off in the distant hills, buckets and buckets of grapes (almost as tall as me) that had just been harvested and even a helicopter that made multiple trips to pick up large buckets of grapes to transport them up the hill. There is also an option to do part of this trail on a small train on wheels. If walking this far isn't doable or if you have multiple children, consider the Lavaux Express Wine Train. My children really enjoyed it!